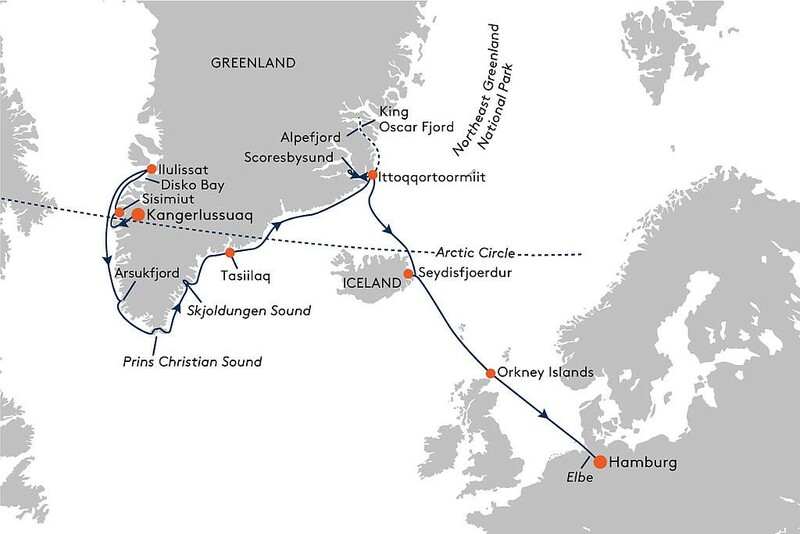 Expedition East Greenland with Disko Bay - superlative "Nordic views"
Please note: your voyage rates include Charter flights as per itinerary in Economy Class. The HANSEATIC inspiration is one of the few ships that can travel not only to Greenland’s spectacular west, but also to the east, where there is little tourist infrastructure and the icy shield opens up only in the early autumn, setting the stage for unique “Nordic views”. As you start your cruise, Sisimiut presents the history of polar settlements in its picturesque old town, which resembles a museum village. On an island hike, your experts will explain fascinating historical details. The imposing mountainous landscape of Ilulissat also offers stunning views on a hike along the ice fjord. A breathtaking natural spectacle will draw everyone’s attention in Disko Bay: while cruising and riding in the Zodiacs, watch the mighty ice formations that drift through the bay. Cast your gaze over the vast tundra in the Arsukfjord – with luck, musk oxen will grace the fantastic backdrop. Prins Christian Sund glistens in beautiful turquoise: enjoy extraordinary and unique views of waterfalls and glaciers. (highlights and landing depend on the weather and ice conditions, including Skjoldungen Sound, Tasiilaq, Ittoqqortoormiit, Scoresbysund, Northeast Greenland National Park) This forms a charming contrast to the warm colours of the landscape in East Greenland’s Skjoldungen Sound; our flexible expedition route also visits the small settlement of Tasiilaq. The Zodiacs will take you up-close to nature – and offer a good chance of spotting whales, among other creatures. Ittoqqortoormiit, Greenland’s smallest community where around 600 people live in complete isolation, is like an Arctic haven of peace. A small museum will take you back in time and bring Inuit history to life. Continue north on a geological journey through the millennia to Scoresbysund, where ice age glaciers have clearly left their mark. Depending on the weather and ice conditions, the HANSEATIC inspiration will take its time over intensive explorations of the world’s largest fjord system. A world of superlatives awaits you: Greenland’s highest mountains, impressive glacier landscapes and icebergs glittering like sapphires shape the region. Awe-inspiring rock faces rise up steeply before you, forming a rugged backdrop to fascinating white ice sculptures reflected in the water. On a hike through the autumn tundra, you might see an Arctic fox before marvelling at the icebergs drifting by in Sydkap, for example. One particular highlight of your expedition awaits you further north in Northeast Greenland National Park: be overwhelmed by the view from the Zodiacs as the mountain flanks of the Alpefjord tower up to 3,000 m (9,842 ft) above you. Equally majestic, the King Oscar Fjord will complete your unforgettable impressions of Greenland’s pristine beauty – perhaps even with a polar bear sighting. Your farewell to Greenland will be accompanied by picturesque mountain landscapes when the HANSEATIC inspiration sets course for Seydisfjoerdur in Iceland. The traditional wooden houses of this small town bear witness to the riches brought by the herring boom. The legendary Scottish Orkney Islands await you with rugged cliffs and mystical light. Explore the historical treasures of Orkney* from Kirkwall, with the Skara Brae Stone Age settlement and the Ring of Brodgar from around 2700 BCE. When you return to the present in Hamburg, you can be sure that a wealth of experiences from the northern reaches of the earth will stay with you forever. A change in itinerary may be required on this expedition. The captain will decide on the best-possible alternative depending on weather and ice conditions and official approval. • Discover glorious Greenland in one intensive experience from the ice of Disko Bay in the west to the remote east – you will never forget the world’s largest island. Expedition Chilean Fjords - an inexhaustible source of diversity. Please note: your voyage rates include Charter flight as per itinerary in Economy Class....click here to read more. Travel from Nassau (Bahamas) to Boston - extend your ocean dream....click here to read more.